One of the enduring difficulties in philosophy since the Enlightenment has been the issue of how a spatially-extended body can be related to a spiritual thinking being. 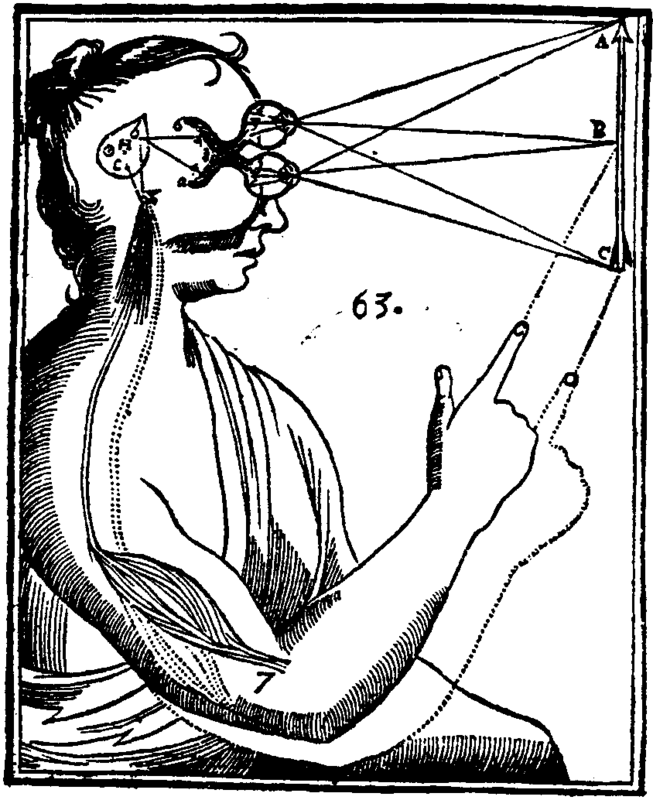 Numerous attempts have been made to offer a solution; Descartes saw interactions between material and spiritual substance, at least in humans, as occurring in the pineal gland. There, the spirit informed the mechanisms of the body; the “ghost”, so to speak, worked the controls of the machine. For some, only the power of God could allow for such distinct things to act in accord. This lead to occasionalism, or the positing of God’s direct willing of bodily action, based off of an “occasion” in the mind. Others would deny that the body and mind ever interacted, or would simply fall back on a mechanistic view of the world that eliminated the soul from consideration. Lost in this muddle of conflicting views is the elegant solution of Leibniz. Holding to the Cartesian distinction of conscious mind and mechanistic body (seemingly, at least, although he is unclear on what he considers the body to be, exactly), Leibniz posited that the material could never affect the immaterial. In this, he stood with the scholastic tradition. This being said, Leibniz did believe that there was a relation between body and mind. This relation was his famous hypothesis of the pre-ordained harmony of both. Quite simply, Leibniz held that God, in his perfect knowledge and wisdom, created a universe in which any change in a body was reflected by a change in the soul, though neither caused the change in the other. As is said in the Monadology, “The soul follows it own laws, and the body likewise follows it own laws; and they agree with each other in virtue of the pre-established harmony between all substances, since they are all representations of one and the same universe.” (1) Of course, to present Leibniz accurately, it must be noted that he did not believe that any substance caused a change in another; rather, all change was “enclosed”, it might be said, in the concept of the individual substances. To put this another way, each substance contains within itself a complete idea of everything it ever will be. The unfolding of this idea as a process leads to instances of what might be normally referred to as “change”. In his Discourse on Metaphysics, Leibniz argues: “... hence the idea itself or essence of of the soul carries with it that all its appearences or perceptions must be born from its own nature, and precisely … correspond of themselves to what happens in the whole universe, but more particuarly … to what happens in the body which is assigned to it …” (2) Without going into a complex discussion of monads and their properties, this will suffice as an explanation for Leibniz’s views on substances as they regard the problem of body and mind. As Arnauld observes in his correspondence with Leibniz, the view of pre-ordained harmony seems to be similar to that of occasionalism. Leibniz responds by flatly denying that God causes the changes in either the spiritual substance or the body. Instead, God merely makes sure that, for every unfolding of the spirit in a certain way, the body also unfolds its concept in a way that mirrors the spirit, or vice versa. God is not the reason “why” the mind or body does something; He is merely the assurance that, given the mind or body does something, the complimentary substance or aggregate will “respond”. Why does Leibniz’s theory matter, to ask the obvious question. Why should anyone bother with such enigmatic metaphysical designs to explain something as simple as bodily movement or the sensation of pain? After all, when pain is felt, it is quite common to say the perception is caused by some physical stimulus, say a cut on one’s hand. Likewise, the raising of one’s arm is due to the willing of that action within the mind. Why does an theory need to complicate such commonplace experiences? To answer these challenges, recourse must be made to the above-mentioned principle that the immaterial and material do not affect each other. To simplify pain perceptions into the stimulation of nerves and the transference of electrical impulses to the brain reeks of materialism. To simplify movement into an ethereal ego flipping switches in some cerebral lobe or gland reeks of spiritualism. Neither can be tolerated by a serious thinker. More importantly, neither seem to truly address the experience of being both a physical body and a non-physical psychological entity. To do this, however, reintroduces the question of how the material and immaterial can interact. Leibniz’s solution deftly sidesteps this by saying what most would agree to be reasonable: the material and the immaterial cannot, and so do not, interact. This does not rule, though, any concourse of body and mind. Instead, they each act independently, although in total harmony with the other. Besides elegance, this explanation has the added appeal of working. It does not suffer from the immaterial-material interaction difficulty. It does not oversimplify the body-mind relation into merely body or merely mind. Instead, Leibniz ably updates, as he does in most of his philosophy, old scholastic ideas to fit within a modern framework of conscious actors and subject experiences. Though esoteric, the solution offered by Leibniz certainly works. To echo famous words from a man made famous by solving robust puzzles: “When you have eliminated the impossible, whatever remains, however improbable, must be the truth.” If one is not willing to commit to either a gross materialism or abstract rationalism, and if one sees the issues of allowing efficacy of the immaterial in the material, and of the material in the immaterial, what is left? The hypothesis of the pre-ordained harmony of spiritual substances and bodily aggregates. G.W. Leibniz, Monadology, trans. Robert Latta, 263. G.W. Leibniz, Discourse on Metaphysics, trans. Lucas and Grint, 56.